Food Hussy Review: Juicy Fried Chicken Class at Tablespoon Cooking Co | The Food Hussy! 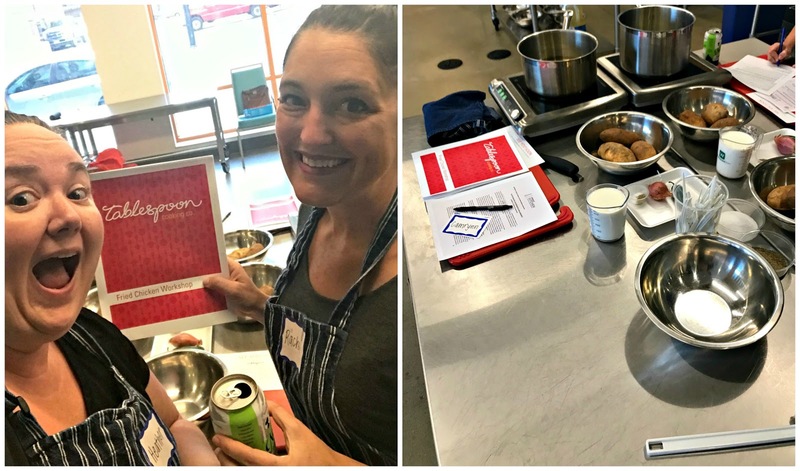 I was invited by Tablespoon Cooking Co to come down to Findlay Kitchen and take a class and then share my thoughts with you. All opinions are my own. Tablespoon Cooking Co. is the brainchild of my friend Jordan Hamons - otherwise known as The Hungry Traveler. Jordan trained at the Midwest Culinary Institute and has traveled all over the world - so her blog is like mine - but with real street cred. Hahaha! I took my friend Rachel with me because she likes fried food and free drinks - but I suppose I have quite a few friends that would fit that bill. The Findlay Kitchen is on Elm across from Findlay Market (and up the street a little). It's a great storefront and the kitchen is used by multiple small businesses. It's a great space and Jordan and her team have the class set up with cooking stations for teams of two. I really like Jordan's teaching style. She breaks the class and recipes up into chunks and she demos what you'll do and then you do it. Here she's showing us good knife skills. Lucky for me - I had this part down pretty well. Throughout the night - we learned how to make wings, fries, cole slaw, fried chicken and more. 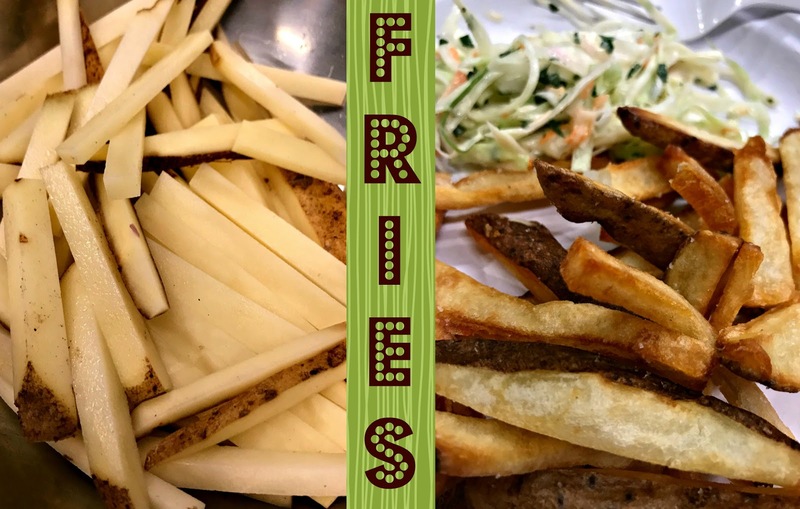 The fries were fun to make - she taught us the most efficient way to cut the potatoes. We also learned the importance of uniformity in size. If you don't have them the same size - some will be raw and others will be burnt. We also learned that rinsing the starch off the potatoes helps make them crispy when you fry them and you get super crispy fries by double frying them. They were so good! We gobbled them up so quick I forgot to take a pic - I had to go take a pic of someone elses! 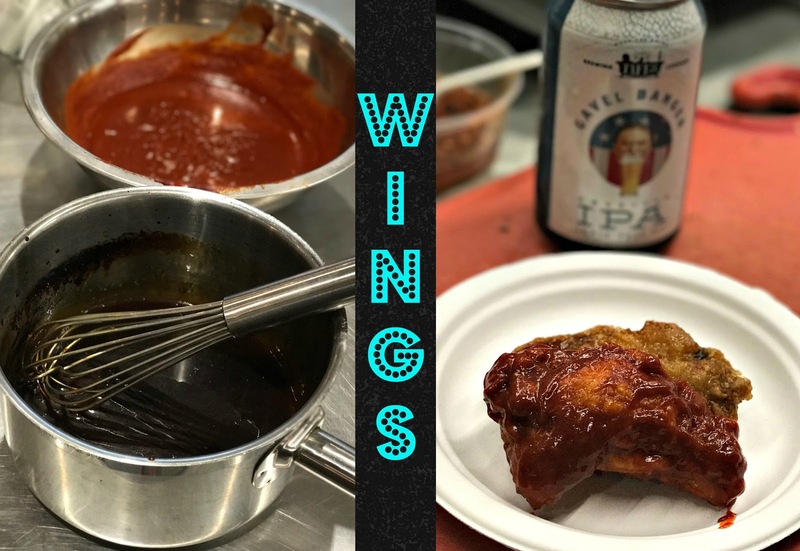 They also made Korean Fried Chicken Wings for us as a bonus with two sauces - one was a spicy Gochujang that will kick the crap out of you and the other was a Soy Garlic Glaze. I much preferred the Soy Garlic Glaze - but they were both really good. Probably our favorite dish of the night was the buttermilk herb aioli - it's mayo, buttermilk, white wine vinegar and fresh herbs. 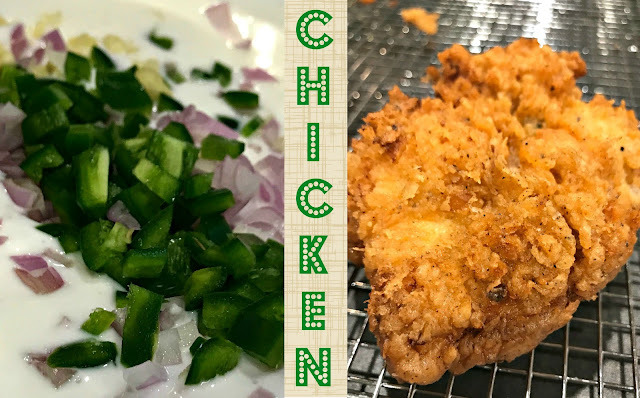 I would never think to add the buttermilk or vinegar but the acidity really gave it a zing and fresh herbs were most definitely the way to go. The aioli was meant for the chicken sandwich we made but I'm pretty sure Rachel and I killed 90% of it on our fries. We also got a super secret (or not - since you can find it if you scroll down) herb mixture for her fried chicken. Herbs and spices just look so pretty - you don't even have to do anything with them and they're a pretty picture. - Never FILL the pot with oil - make sure you keep plenty of room above the oil and use a deep pot. You'll see in the image above - the oil is less than half way full in the pot. Just use enough for what you're frying to have room to move around. - Check the temp with a thermometer - Jordan recommends Thermapen - hers (shown above) has lasted her years and is super quick and very accurate. After all that we were ready to go - we double dredged the chicken in the marinade & flour and then into the bubbling oil it went. 5-8 minutes later - the crispy perfection is ready! You can tell by the color - you want a dark golden color - too light and it's not done yet. Keep a close eye on it - you don't want all this work to go to waste! And there you have it! We used boneless, skinless chicken breasts so we could make sandwiches with them - but you could use bone-in as well. This chicken was completely amazing - it was so juicy and crispy - by far the best fried chicken I've ever had in my life. Why Should You Go? I highly recommend Tablespoon classes. We came home with chicken and sauces as well as a thorough handout of all the recipes demonstrated in class. Jordan is super friendly and her staff was there for us every step of the way. I really enjoyed it and would definitely take her class again. I love the hands-on level of the classes and it's great if you're really wanting to learn how to cook - in general or a specific dish. Recipe from Tablespoon Cooking Co.
Make the marinade: mix together all ingredients in a medium mixing bowl. Set aside. Make the seasoned fl our: whisk together all ingredients in a deep wide dish. Set aside. Lift one piece of chicken at a time from the marinade and dredge really well in the seasoned fl our. Return the chicken to the marinade, fully submerge one more time, then dredge again in the seasoned flour. Shake off any excess our and set aside. Pour the oil into a heavy, deep pot to a depth of 4 inches. 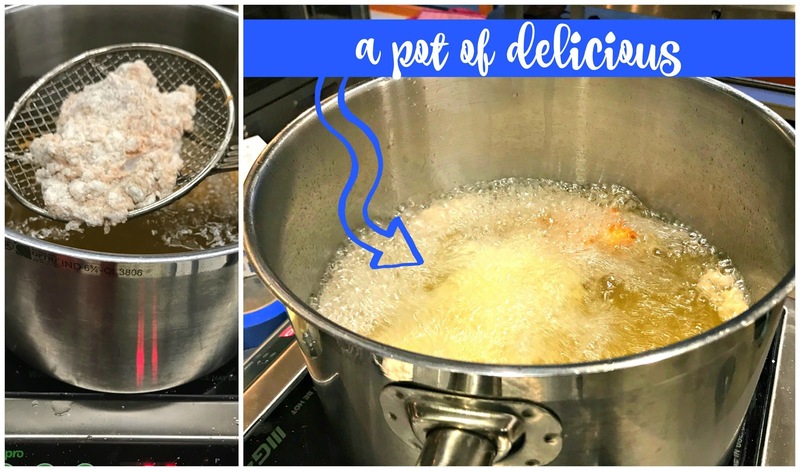 Heat over medium heat until the temperature reaches 350-degrees F.
Use a wire spider or slotted spoon to carefully lower the chicken into the hot oil. Fry 2 pieces at a time until the crust is a deep golden brown, about 5-8 minutes. Transfer the chicken to a paper towel-lined plate to drain.